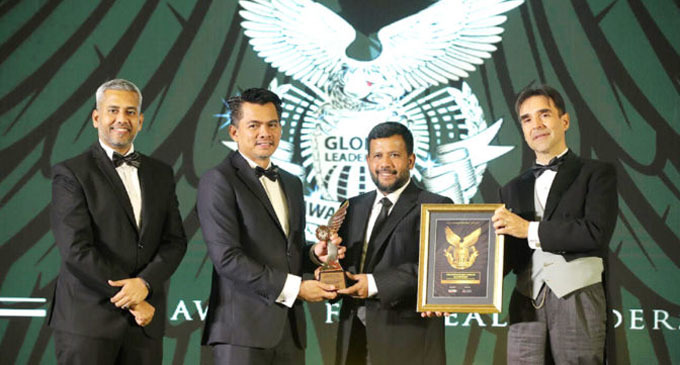 (FASTNEWS|COLOMBO) – Sri Lanka’s Minister of Industry and Commerce Rishad Bathiudeen has won a Global Leadership Award at Malaysia’s Global Leadership Awards 2018 (GLA 2018) event at Kuala Lumpur Hilton on Wednesday (25). GLA 2018 targets CEOs, CFOs, COOs, CTOs, CSOs, Members and the Chairman of boards, Celebrities, Sports Personalities, Community Leaders and other key organizational leaders with distinguished activity. GLA 2018 was awarded to many recipients in 30 categories and Minister Bathiudeen won under “Global Leadership in Trade Development Award” category. “After stringent evaluations conducted by our international panel of judges, we have recognised the Honourable Minister’s deep dedication in spearheading trade development, and for your continued efforts in steering the nation to greater heights. The Leadership values that the Honourable Minister consistently display, in moving forward and adapting as necessary according to the requirements of the economy, motivates us to honour you on this manner. It is with great pleasure that we confer upon the Honourable Minister this coveted and most prestigious of awards, in recognition of your achievements in the arena of leadership” said Arthur F. Carmazzi, the Guru of Global Top 10 Most Influential Leadership in his conferment statement, sent to Minister Bathiudeen.